If you taste hot coffee or cold ice cream sometimes you will feel that your teeth’s are going out of control with some pain. If you are sensitive to such type of things then we call you have sensitive teeth. Sensitive teeth are a real problem for millions of users. Even if it’s very hot or cold they will become very sensitive. 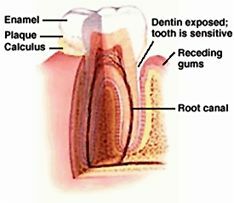 The main reason for this sensitiveness is because a part of your dentine is exposed and it becomes sensitive. There are other reasons for teeth sensitivity like gum recession, dental erosion, tooth grinding and gum disease. By reducing the pressure on your teeth’s while brushing you can reduce some pain. To avoid heavy pain from these activities you can go for the help of natural home remedies that effectively cures sensitive teeth. Home remedies are in increasing demand nowadays. Since it is less expensive and treats all types of teeth issues very effectively more and more people are moving towards home remedies. These home remedies doest not contain any therapies which are normally practiced by doctors. They are safe to use without any side effects. Make use of the desensitizing toothpaste: Tooth becomes sensitive due to gum disease or gum recession. This is the kind of disease that can not be treated with the help of dental fillings. In such cases try using the desensitizing toothpaste that covers the affected part. It is a special kind of toothpaste that contains elements that deal with sensitivity. Using this toothpaste you can fill channels or tubules in your teeth. Attach the toothpaste on cotton swab and use it on the affected parts every day before going to bed. Repeat the process for couple of weeks without a miss. Don’t rinse but spit toothpaste properly. After couple of days you will feel less sensitive. Rinse with fluorides: Fluoride rinse available in most of the grocery stores. You can use this medication if you are facing decay problems. It is recommended to use at least once in a day. If you are feeling heavy pains then try with large doses fluoride rinse. One simple solution to avoid sensitive tooth is to keep teeth clean and healthy all the time. If you eat gummy substances it produces acid on teeth and increases the sensitiveness so to avoid acid content at least brush twice in a day. It is preferred to brush after eating and before going to bed. Always use soft toothbrush: if you apply too much pressure on teeth then there are chances of affecting teeth especially at tooth enamel. Some times teeth also vulnerable to toothbrush abrasion. Apply little pressure and move slowly and it will become effective than pressing too hard. Also, you need to know how to brush your teeth. Don’t eat too much of snuffs like tobacco since it is responsible for damaging the lower portion of the teeth. Tobacco is commonly used by many teenagers nowadays. So please avoid using them and protect yourself from severe dental disease.